"In settings where home birth is still the norm, safe clean care during labor and the postnatal period are critical to survival," says nurse midwife Lynn Sibley (bottom right). Nurse midwife Lynn Sibley was in rural Belize watching traditional birth attendants assist women in labor. As the women vigorously pushed and pulled the mother’s cervix, something midwives in the United States are trained never to do, she cringed. But she was there only to observe, conducting research for an anthropology dissertation. She made it clear to the attendants that she wouldn’t interfere unless they asked for her help, and in a couple of emergencies, they did. That experience was fresh in Sibley’s mind when she began to develop a program to train birth attendants and midwives in developing countries while respecting cultural norms and beliefs. She first tested the program in India, and it worked so well that it spread to six other countries, including Haiti, Bangladesh, and Ethiopia. Now, with the help of an $8.1 million grant from the Bill & Melinda Gates Foundation, Sibley is taking the Ethiopian program to a national level. The grant is the largest ever to Emory’s Nell Hodgson Woodruff School of Nursing, where Sibley is an associate professor. “In settings where home birth is still the norm, safe, clean care during labor, delivery, and the postnatal period are critical to survival,” Sibley says. With a population of 80 million people, Ethiopia has one of the world’s highest birth rates. It also has one of the world’s highest rates of maternal and newborn deaths. In sub-Saharan Africa, the risk of maternal death is 1 in 16, compared with developed countries, where the rate is 1 in 2,800. 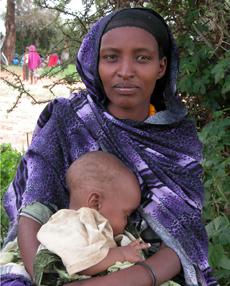 More than 25,000 women in Ethiopia die of birthing complications each year. The infant mortality rate is just as grim. An average of 81 newborns die per 1,000 births in Ethiopia, whereas in the United States, the average number of newborn deaths per 1,000 births is six. The vast majority of babies in Ethiopia are born at home. placenta. Ethiopian instructors distribute the packages, which include picture cards for illiterate populations, to health extension workers, community health volunteers, and traditional birth attendants. The program, however, stops short of teaching birth attendants or families to handle serious complications on their own. In such an event, families are encouraged to seek professional help. But for many people in developing countries, help is hours away. 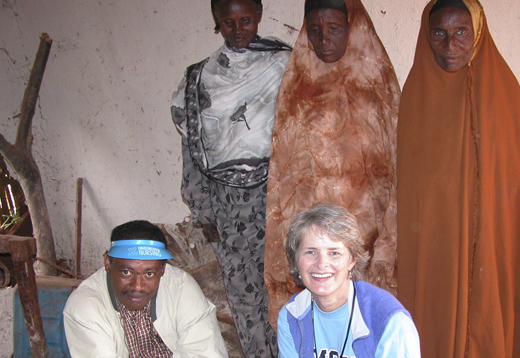 Sibley is excited about the prospects in Ethiopia, based on her prior experiences. When she first tested her strategy there, what was supposed to be a two-hour session with village elders turned into two days. The elders were so interested in the program that they wanted help to set up their own data-collection system. News Release: "Emory School of Nursing Receives $8.1 Million Gates Foundation Grant"